Among the most popular names that you would come across when looking for decent quality bunk beds would be Julian Bowen. Julian Bowen bunk beds are quite popular and there has definitely got to be a reason behind that. From their appealing designs to quality workmanship, everything seems to have contributed in making home makers love the Julian Bowen bunk beds. Therefore, if you need bunk beds that are from a reputed brand and a reliable manufacturer, and you would like your bedroom to appear modern and stylish, then you should perhaps, or even definitely, not look beyond Julian Bowen. Bunk beds are helpful in a range of different ways and nowadays, they are not exclusively for kids as there are bunk beds for adults too. However, since they are space saving furniture, they are usually ideal for kids and if you are looking for the best quality bunk beds for your children then Julian Bowen bunk beds would be cool. Julian Bowen have a few different varieties of bunk beds so picking one would be easier when you know what you require together with having proper and complete details about each of the varieties of Julian Bowen bunk beds available. The Domino Bunk bed is the ideal space saver. With built-in shelving it eliminates the need for bedside tables whilst keeping your childrens essentials close within easy reach. 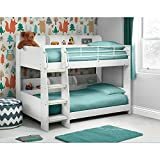 Finished in bright white the Domino bunk bed coordinates easily within both boys and girls bedrooms. Made in the UK from a tough wood combination the Domino bunks are highly durable with slatted bed bases. The Domino bunks include lots of safety features making them ideal for younger children. They support a maximum weight of 15 stone, you wonï¿½t need to replace them until your children are ready for adult beds. The bunk features chunky easier to climb ladders which are fitted with glow in the dark light strips, ideal for night time visibility. The ladder also has supportive handles at the top for an assisted climb. Both bunk beds fit standard UK single mattresses (90x190cm/3ft). Mattresses are not included and will need to be purchased separately. The Domino bunk bed will require self-assembly. Created for the Julian Bowen pine bunks and beds, the Wheelie Bin is an additional underbed drawer designed to keep the mess out. Cafted from solid pine and MDF, ensuring durability. Finished in an antique lacquered finish, the Wheelie Bin is suitable for almost any décor, availble in pine or stone white. Featuring a sprung slatted base for extra comfort and additional mattress life with sturdy easy to assemble fittings. An innovative and highly functional cabin bed offering incredible versatility with three storage drawers, a cupboard, shelf and desk neatly integrated into a sharp, contemporary design. A sleek matt finish in white and charcoal grey makes the Cookie Cabin Bed the perfect combination of style and practicality for any children's or teenager's bedroom. The lower bunk is positioned close to the ground, making it ideal for smaller children, while the robust ladder features attractive cut-out handles and the option of glow-in-the dark strips. Perfectly suited to the Hamilton Bedroom Collection by Julian Bowen.